Unpack the rar archive and burn the CUE sheet on CD-R (CD-RW is no good) slowly (<= 8x) with Nero, CDRWin or compatible. 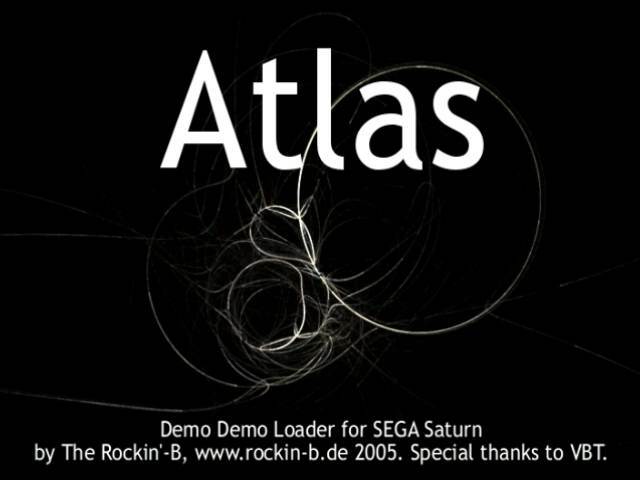 Run CD on a modchipped Saturn or perform the swap-trick. Juding these entries turned out to be a lot harder than I thought. 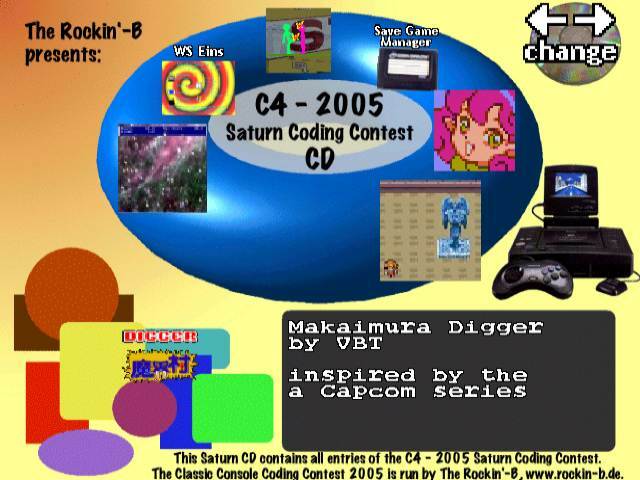 The Saturn homebrew scene has come a long way since I last looked at it and every single entry seemed to be an improvement over currently existing homebrew. It's clear all of you put a lot of effort into your entries and I wish I could give you all the number one spot (but then it wouldn't be much of a contest). The gameplay and overall rating sections were particularly tough to judge, particularly given the diversity of game styles in the entries. In case you wonder: all judges who sent in a rating are listed here, all others that might be mentioned elsewhere did not. Denymetanol The GEM of these collection, in my viewpoint.... These game maybe more simply, but is more additive, and all aspects such sound and a 2player feature makes more fun the demo. 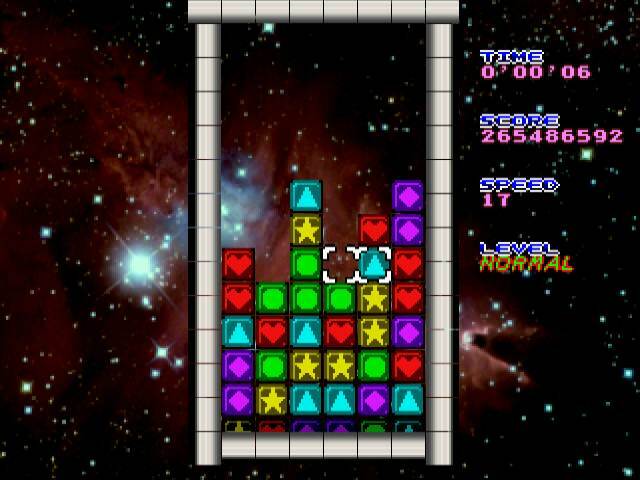 And the TETRIS-COLUMMNS-PUZZNIC formula works well, only difficult maybe more hard in a EASY levels, you are pushed to limit making pieces to explode quickly, and see the game over text more often. The game lack a PLAYING Instructions, but have a coloured MANGA STILY CHARA on main screen and a simply correct sound aspect. 1. If this game wasn't so hard it would have been my top choice, no question. It has several good tunes, appropriate sound effects and clean colorful graphics. The gameplay mechanic seems sound as well, but even on the easiest setting I had trouble getting anywhere in this game. It sort of looks like the difficulty selector is broken. Selecting "easy" results in "normal" being displayed in game and selectiong "normal" results in "hard" being displayed in game. Perhaps once this bug is fixed it will be playable by mere mortals such as myself, but as it stands it's just too hard. Ryo Suzuki Un sensacional juego de puzzle y el más cercano quizas a lo que sería un juego comercial. Muy equilibrado en todos sus aspectos. Musica, sonido, jugabilidad. El género de puzzle es tal vez más facil de imitar, pero esta entrada lo hace muy bien. So stelle ich mir ein perfektes Puzzlespiel vor. 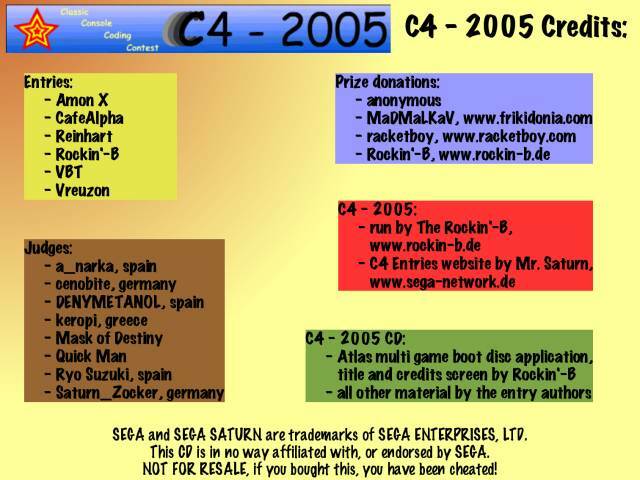 Für mich ist Planet de Pon, der Klare Sieger des C4 Bewerbs. Es wirkt sehr professionell gemacht und kann auch für längere Zeit motivieren. 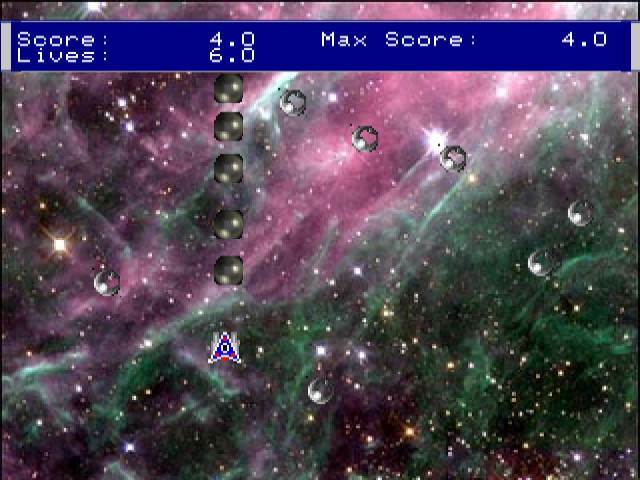 Denymetanol A nice "Asteroids" Clone Shooter, more additive, with great quantity of sprites on screen... only a few graphic glitches on BUBBLE SPRITE lacks the graphic aspect...... (appears 2 white block pixels around the bubble) the background with black space with simple POINT stars simulating tehe cosmos is a bit poor, but works. The bullets of the ship are too big, maybe another colour than gray METALLIC balls maybe works better. (any kind of laser, bullet, ...more "visually impacting"... Sound its a bit poor, the game has an instruction (how to play) screen too, but poorly implemented on bluebox with white text. Gameplayability it´s simple but very additive. 4. This game was probably the most well rounded of the batch. It has music that fits the game well, decent sound effects, good graphics and is genuinely fun to play. It starts out easy, but cranks up the difficulty at a good pace. The way the bubbles bounce off the sides of all 4 corners of the screen makes the gameplay relatively novel in a crowded genre. That said, Bubble Invasion still has room to improve. There's only one music track and it doesn't repeat after it's done playing, leaving you with silence apart from the sound effects. Also, after a few waves of bubbles you start to desire to have a new kind of enemy or object to interact with. The title screen seems to hint at other objects but they either aren't currently present in the game or are introduced a bit too late. deberían tener un poco más de IA. + einfaches, aber geniales Spielprinzip. Eines meiner persönlichen Favoriten. Leider wirkt das Spiel etwas eintönig, aber sonst ist das Spiel sehr gelungen. Verschieden Hintergrundsbilder wären jedoch noch erwünschenswert gewesen. 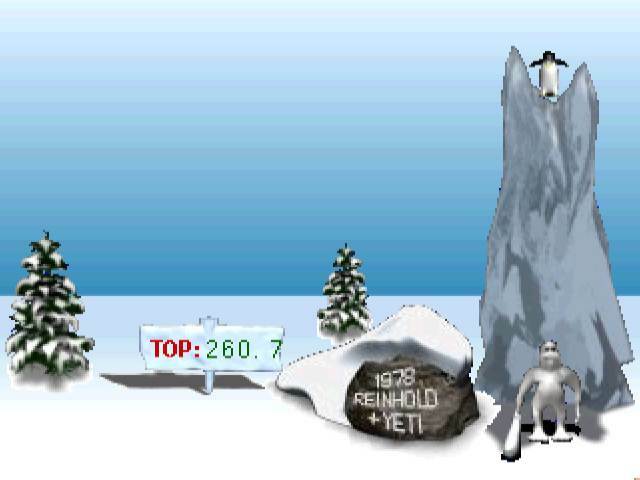 Denymetanol These demo shows a WELL KNOWN friend of mobilephone java games, our friend YETI, from the YETISPORTS saga. These exercise of Saturn programming seems to be only a Conversion of the popular game, complexity to RECREATE in all aspects the mobile game are well recreated, with one lack, the playability depens ONLY IN THE TIMING to press the A or C Button, in the adecuate movement, all rest of the game is only see with JOKE the animation of the PROPULSED flying penguin..... the sounds are the same, only the work of convert audio. Nice and clear adaptation. Very equilibrate in aspects demo. The Gradient of the background it´s good, but more PARALLAX SCROLLS maybe do a better TRI-DIMENSIONAL simulation, and SPEED sensations in these 2d demo. 3. Winter Sports Eins looks really good. It has a mix of pre-rendered 3D and more traditionaly 2D graphics and is well animated. The sound effects work well with the game. My biggest problem with the game was that I found the gameplay to be too shallow for my tastes. It's fun for a while, but it gets old fast. I think it needs one or two more ways to effect the flight of the penguin to give it enough sophistication to really shine. vez lo único a mejorar sería el sonido. Witziges Spiel mit netten Animationen. Weitere Modi wären jedoch noch erwünschenswert gewesen. Denymetanol International Karate makes the legend, but Stephano has did a good fighting experiment. The Backgrounds are a good detailed photographs of different world places, and uses all Saturn colour palette. But in opposite way, the both fighters makes the difference, both are like a pencil simple sketches, with 3 colours or less, and makes a great quantity of attack routines, you can choose a variation colours to CUSTOMIZE your character, only a bugs in menus makes more confuse to play in a beginning, but pushing with insistence the controls you finally begin to fight, and a HOW TO PLAY screen with a pad diagram makes more CLEAR the way of play this Versus Beat´em´up. Nice, and for me, very fun. ( i like 2d fighting games). Game are more sound completed, and adds kick and punches sounds. 2. Despite the relatively limited graphics in this game, it manages to have a sense of style that works. The wacky color choices, simplistic graphics and in-your-face victory screens give it an edgy feel. I think it's biggest problem is that it's hard to get any sense of what you did right or wrong to win or lose a battle. As a result the outcome felt kind of arbitrary which took some of the fun out of the game. Jumping is also a little awkward which makes it difficult to get out of the way of the beer truck. muy originales con aspecto de hechos a mano. Si el sonido fuese un poco mejor esta entrada sería redonda. + gelungenes Intro bzw. Menü. Denymetanol Amazing Recreation of the Capcom´s (tm) universe mixed with the classic game of the tunneling, Digger. Nice mix...maybe very poor the musical and FX aspects with none kind of sound. Traveling to Graphic aspects... i detected very simple background, but all sprite based on capcom series are well recreated, and well animated, maybe the transformation can be better implemented....zombie transformed to an evil butterfly. The bug of an automatic PAUSE before begin to play can be corrected. The game is cute, but finished with "stetic" failures. Other interesting features are to collect COINS to gain points. The 2 player mode is an interesting way to make the game more competitive. And Howtoplay screen is added to Explain the game purposes. A detail is the typographies used on the game, 100% the same as capcom saga. A nice detail, such the original saga´s G&G logo. 6. I like the concept behind this game, but the current implementation leaves a bit to be desired. The lance seems to be pretty useless given how quickly the enemies respawn and how long it takes for it to recharge. Being a sort of action game, the lack of sound is more of a problem than in Dungeon Escape. The graphics for the hero and the items he collects are pretty decent, though the former could use some animation. The initial state of the enemies looks kind of funny to me. The "frenzied" state seems to look better, but it's hard to say since they move rather fast. I think the gameplay could use some tweaking to add a touch more strategy and a little less frantic d-pad action. Even though I rated it last overall, it's a good attempt and with some work it could be a lot more. comportamiento. Lo peor tal vez sea la falta de audio. 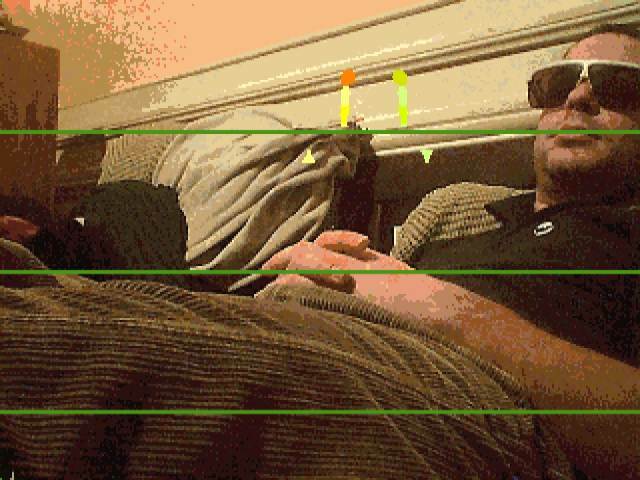 Denymetanol Interesting development to make in a saturn a ZELDA STYLE Roleplaying adventure. The game viewed on TOP, seems to be incompleted as result of lack of time, maybe one day we can enjoy a full title very fun to play. This demo can be interpreted such a programing exercises on saturn making to play with it it´s more frustrating, you walk two pixels and enter in ONLY SCREEN TEXT battle..... none sprite more than the CHARACTER appears, and a poorly blank screen with STATS about player is a SUBSCREEN..... visually shows a BRICK DUNGEON STYLE with a simulation of perspective to make the walls of these style of dungeon or castle... the character it´s a cute sprite, very fun, that seem to be familiar of link of Nintendo´s Zelda Saga. The sound it´s only a beep, and no more sounds, another part incomplete. 5. Clearly this game has a ways to go before it's done, but it shows a lot of potential. It's sort of reminiscent of a text adventure me graphics thrown in. 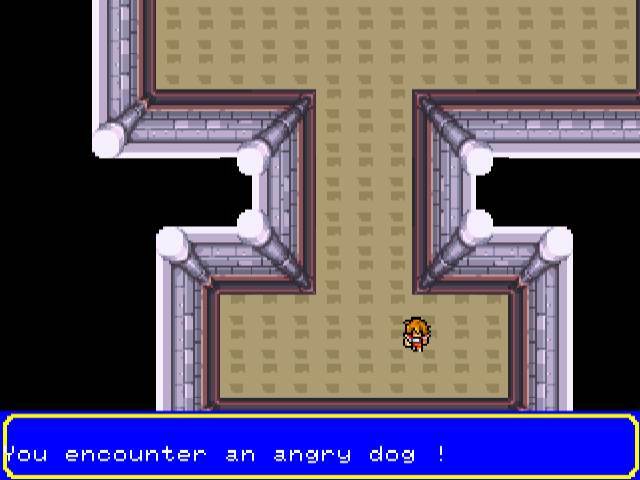 The graphics when present look pretty good: about what I would expect from an SNES RPG. The puzzle to escape the dungeon was fun to solve and the dungeon itself was big enough to be difficult to navigate without drawing a map. 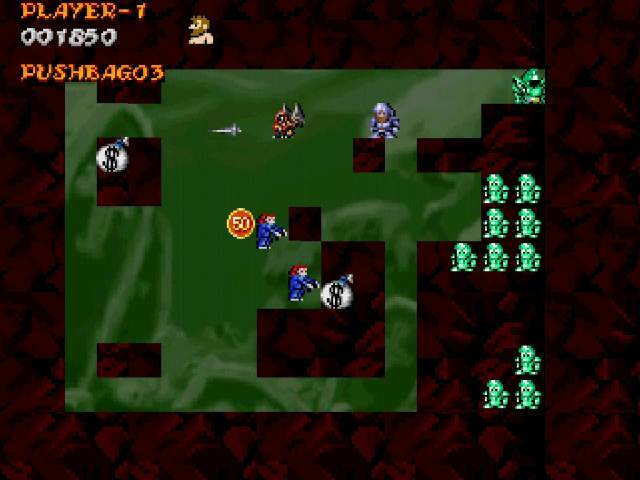 With an extended dungeon, a more sophisticated battle system and some music this game could be a real gem. jugabilidad hacen que esta entrada no pueda llegar más lejos. Gerade bei diesem Spiel habe ich mir bei der Bewertung sehr schwer getan. Gäbe es eine Soundunterstützung und wäre das Spiel nicht so monoton aufgebaut, würde die Bewertung sicher anders sein. Positiv hingegen sind die logischen Rätsel. This page is not affiliated with, or endorsed by Sega or any other company. All appearing trademarks belong to their respective owners.